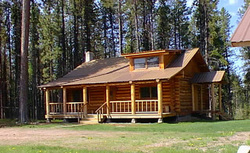 Adorable, quiet, cozy log cabin - charming and well equipped. Stereo. Stunning views of Swan Mountain range from large covered porch with swing and hammock - close to lake for all season activities. Sleeps 4. Two bedroom; 1 king and 1 queen. Microwave, BBQ, washer and dryer, wood stove, and electric baseboard. Non-smoking, No pets.